Press Release: August 27, 2017 (Originally released August 23, 2017) By Sanman Promotions- Ten undercard fights will spice up the much-anticipated “Road to Stardom” fight card. Jim Claude Manangquil, chief executive officer of Sanman Promotions, said the full card of the boxing extravaganza slated September 9th in Polomolok, South Cotabato has already been finalized. The undercard fights will be led by Randy Petalcorin (26W-2L-1D, 19KOs), who will take on Jetly Purisima (21W-23L-4D, 7KOs) in an eight-round duel under the 110-pound division. Eden Sonsona (36W-7L-2D, 13KOs) will battle Jaime Barcelona (36W-61L-1D, 10KOs) in a fight scheduled for six rounds. Jayson Mama will collide with Bimbo Nacionales, while Rimar Metuda will tangle with Gabby Simpo. John Mark Apolinario will trade leathers with Jestoni Makiputin, while Mark Antonio will test Michael Padayag. Dave Apolinario will clash with Rudy Salaton and Jerven Mama will square off with Jerry Tabamo. The rest of the undercard will have Michael Garcedo versus Jason Tresmonte and Jaeger Bereno against Jessie Boyles. The upcoming fight will be headlined by the unbeaten Jade Bornea, who will try to defend his IBF Youth Super-Flyweight belt against Thailand’s Jakkrawut Majoogoen. The main event promises to be an explosive one as Bornea and Majoogoen both sport impressive records. Bornea is yet to lose in eight fights with five knockout wins, while Majoogoen, a former WBC World youth champion, has 19 wins with just one loss and 11 knockout wins. The equally exciting main supporting bout will pit Ben Mananquil (14W-1L-2D, 3KOs) and Rhey Waminal (11W-1L-0D, 6KOS). Mananquil and Waminal will fight for the Oriental Pacific Boxing Federation (OPBF) Silver Bantamweight title. The card will be streamed live via the Sanman Promotion’s Facebook page SANMAN Live. Material Courtesy of Sanman Promotions Used with Permission. For more information about Sanman Promotions and to watch the Sanman Live series please visit Sanman Promotions’ official Facebook page at: www.facebook.com/SanmanPromotions. One of the biggest stories throughout all of combat sports in recent months has been the showdown between future Boxing Hall of Famer Floyd Mayweather and two-division MMA world champion Conor McGregor. An encounter that will take place in a Boxing ring and under Professional Boxing rules. A fight that has frankly morphed into more of an event that is expected by some to break existing pay-per-view records. What makes this unique is this is a fight between two elite fighters in their respective sports, but a scenario where McGregor, the current Ultimate Fighting Championship (UFC) Lightweight world champion, will be competing for the first time as a professional boxer. The idea of a fighter who is making his professional debut stepping in and competing against one of the all-time greats of the sport of Boxing does seem like an unlikely scenario. It is however, a scenario that is not completely unprecedented. There have after all been several fighters throughout combat sports that have ventured into Boxing and/or MMA from a primary discipline and have been able to have success in a combat sport that is out of their element. Some might remember Troy Dorsey, a former world champion kickboxer, who went on to win two world championships in Professional Boxing, most notably winning the vacant IBF Featherweight world championship in August 1991 by scoring a first round knockout over Alfred Rangel. Dorsey would go on to become a two-division world champion by winning the IBO Jr. Lightweight world championship in October 1996 with a stoppage of Jimmi Bredahi. Fans who are familiar with the more recent eras of the sport may be familiar with former WBO Jr. Welterweight world champion Chris Algieri, who before embarking on a career as a pro boxer was a two-division world champion in Kickboxing. There have been fighters such as former Professional Boxing world champions Ray Mercer and Holly Holm, who have ventured into MMA and have been successful and former Elite XC MMA world Lightweight champion KJ Noons, who had a short, but successful career as a pro boxer having won eleven of thirteen professional fights. There have also however, been fighters whom were not successful in an attempt to transition from one discipline to another when at UFC 118 in August 2010, former multi-division world champion pro boxer James Toney was quickly submitted in his one MMA bout at the hands of two-division MMA world champion and UFC Hall of Famer Randy Couture. Although the Couture-Toney bout at UFC 118 may serve some as a cautionary tale for fighters who are considering venturing into MMA from another primarily combat sports discipline, it is important to note that in the case of the Couture-Toney bout, Couture a fighter who was a former collegiate and Olympic alternate wrestler prior to his MMA career immediately took Toney, a fighter who had no experience in grappling or submission fighting down to the canvas not allowing Toney to use his hands where he would have theoretically had an advantage and scored the victory. Even though Connor McGregor, who has a 21-3 record in MMA, has some Amateur Boxing experience, what he will be attempting in his first fight as a professional boxer against a fighter in Floyd Mayweather, who is undefeated in forty-nine professional fights in Professional Boxing, who was considered the best pound for pound fighter in the world prior to his retirement in 2015, will be facing what appears on paper to be an uphill battle. McGregor however, has quick hands and has shown in his MMA career that he is capable of scoring knockouts having scored KO’s in eighteen of his twenty-one wins. McGregor’s extensive MMA pedigree notwithstanding, it is important to remember that this will not be a fight fought with MMA gloves and will be fought with Boxing gloves. Whether or not the change in sport and gloves will have an effect on McGregor’s punching power remains to be seen. The one factor that McGregor can point to as a sign that fans and more importantly Mayweather shouldn’t underestimate him is he is undefeated in MMA fights that have ended by knockout. Another factor that the twenty-nine year old McGregor may point to is he is facing a fighter in Mayweather who is nearly two years removed from active competition and is now forty years old. Mayweather, who last fought in September 2015 scoring a one-sided twelve round unanimous decision over former two-time Welterweight world champion Andre Berto, is known as one of the best defensive fighters in the history of the sport. In quietly watching all the events that have taken place to hype this event, this observer has thought of what is likely to take place when Mayweather and McGregor do battle on Saturday night at the T-Mobile Arena in Las Vegas, NV. Simply put McGregor must show early on that this is a fight and not an occasion in the history of Boxing that will be known more for “The Event” rather than as a competitive contest and must show he can land punches on Mayweather more than occasionally. This is of course, easier said than done against a fighter of Mayweather’s caliber and experience. Mayweather meanwhile, despite what he has said in the build up to this encounter about wanting to give fans a show is likely to implement a similar strategy as he has done throughout his career by setting traps and looking to counter his opponent’s mistakes. A question that those who don’t believe McGregor has much of a chance in this bout might be asking is if the opportunity presents itself will Mayweather go for a knockout. Although Mayweather is not known as a fighter who scores knockouts having scored KO’s in twenty-six of his forty-nine career wins and has not scored a knockout since a controversial, but legal knockout of Victor Ortiz in September 2011, he is a fighter who has shown when he wants to be aggressive that he can end fights rather than winning fights on points by what more often than not have been convincing decisions. What this observer is interested in is to see if the fight is lopsided in Mayweather’s favor as some expect whether he will try to score a knockout or if he will elect to simply out box McGregor to a unanimous decision. Given that this fight, much like Mayweather’s mega fight against Manny Pacquiao in May 2015 is being sold to the public on a pay-per-view basis for the exact same price of $99.95 and seeing the litigation that followed from disgruntled fans who filed suit alleging fraud due to the fight not living up to expectations, it is fair to ask whether or not a similar situation might occur following this fight regardless of what happens in the ring. “The Event” featuring a clash between an elite level future Hall of Fame boxer, who is out of retirement for what he insists is a one-time appearance against an elite level MMA fighter, who can also make a case as being a future MMA Hall of Famer has certainly sparked fans and experts of both respective sports curiosities. The fact is no matter what one thinks prior to this fight, no one knows what will happen and despite all the hype that has preceded this “Event”, the one thing that is real is the “Curiosity” of the public. Although this observer has covered many “Big Events” over the years that failed to live up to expectations and left the public feeling disappointed and/or outraged, it is my hope that at the end of the day Mayweather-McGregor will be remembered as being a competitive fight that exceeded expectations rather than the “Black eye” some in Boxing have predicted. If a good or even great fight breaks out when Mayweather and McGregor square off it will ultimately benefit both Boxing and Mixed Martial Arts in the long-term even with the public being asked once more to pay an inflated fee to see "The Event" take place. Mayweather vs. McGregor takes place tomorrow night (Saturday, August 26th) at the T-Mobile Arena in Las Vegas NV. The fight can be seen on a pay-per-view basis on cable and satellite throughout the United States and Canada for $99.95 HD/SD as well as online via www.ShowtimePPV.com and www.UFC.TV. The fight can also be seen at select movie theaters. For more information on theater locations please visit: https://www.fathomevents.com/events/mayweather-vs-mcgregor/theaters Check your listings internationally. The encounter was also special as it also marked the first time that there would be one “Undisputed World Champion” in the modern era of the sport in the historically talent deep 140lb. Jr. Welterweight division. Terrence Crawford, the undefeated two-division world champion is certainly no stranger to big fights that could define one’s career after previously holding the WBO Lightweight world championship and unifying the WBO and WBC world championships as a 140lb. Jr. Welterweight and in the process established himself as the division’s central figure. Although being the central figure of a weight class theoretically puts a fighter in a position of being able to garner lucrative fights and puts that fighter in the spotlight of a division, it is not always the case that a fighter in that position will be able to secure marquee bouts against fighters who are considered the top fighters in the sport. After all, Crawford was thought to be a potential opponent for future Hall of Famer Manny Pacquiao for a period of time, but that fight did not materialize. This put Crawford in a position of needing a marquee opponent. Enter Julius Indongo. Indongo established himself as a player in the Jr. Welterweight division with a devastating one punch first round knockout over IBF/IBO Jr. Welterweight world champion Eduard Troyanovsky in December of last year. Indongo followed that victory by adding the WBA Jr. Welterweight crown to his unified world championship with a dominant twelve round unanimous decision over multi-division world champion Ricky Burns in April of this year. Although much of the main spotlight of the sport has been focused away from the 140lb. Jr. Welterweight division, this created a scenario that Boxing fans clamor for. Two undefeated world champions, the only two world champions in a division, putting their respective crowns on the line to determine an “Undisputed World Champion.” Despite the encounter between Crawford and Indongo appearing as though it might have been an evenly matched bout between two boxer/punchers, Crawford made quick work of Indongo dropping him once in the second round with a right hand that landed behind the ear and finished him off with a flush left hook to the body in round three that sent Indongo down for the count. Crawford had clearly proven to not only be the central figure of the Jr. Welterweight division, but the one and only champion. What was also noticeably absent from this unification bout to determine an “Undisputed World Champion” as compared to some others in the history of the sport was an element of controversy. This was about two world champions pitting their skills against each other where one fighter simply bested the other. Something that should be viewed as refreshing for the sport. It was however, not without an element of the politics of the sport as the International Boxing Organization (IBO) opted to strip Julius Indongo of its Jr. Welterweight world championship in the days before the fight. This does not change the fact that Terrence Crawford emerged from this fight as the one and only Jr. Welterweight world champion. What remains unclear as of this writing will be what will become of the IBO portion of the World Jr. Welterweight championship. We are probably not going to get an idea of what may happen until it becomes clear what Terrence Crawford will do next. One option for Crawford could be for him to remain as a Jr. Welterweight where one might assume the IBO could recognize him as it’s world champion in the division and in the process eliminate any questions of the sanctioning organization’s validity as Crawford did knock out the man who previously held the IBO crown and did so in decisive fashion. The other and perhaps more likely possibility seeing as Crawford has for the moment cleaned out the Jr. Welterweight division is for him to turn his attention to the 147lb. Welterweight division where like many previous Jr. Welterweight world champions before him have moved up in weight to seek further world championships and more lucrative paydays. As has been the case over the years when an “Undisputed champion” has either moved out of a division for other opportunities or lost their championship without being defeated in the ring, if Crawford does vacate his crown it will leave the Jr. Welterweight division wide open. A likely scenario, which if it does indeed happen will almost certainly mean that there will not be an “Undisputed world champion” in the 140lb. Jr. Welterweight division for some time. It will however, create some interesting possibilities that for Boxing fans watch and debate as they occur. We will have to wait and see what is next for both Terrence Crawford and the Jr. Welterweight division. Press Release: August 20, 2017 By Sanman Promotions - In a stunning development, the fight between unbeaten fighters Harmonito “Hammer” Dela Torre and Saul ‘Kid Dinamita” Rodriguez is off. Jim Claude Manangquil, chief executive officer of Sanman Promotions, announced that Rodriqguez pulled out of the fight. “We had our contract signed and just a couple of days before the fight, Saul pulled out. It’s frustrating but things like this do happen in Boxing,” said Manangquil. Dela Torre and Rodriguez were supposed to fight on August 22 at the Sams Town Hotel in Las Vegas, Nevada, USA. It was supposed to be an eighth-round, non-title fight under the Super Featherweight division. Dela Torre was saddened by the cancellation. “It’s really frustrating to be in this situation. I have prepared well and just like that, the fight got canceled,” said deal Torre, who has been training in Miami, Florida for the past three months along with Sanman Boxing Gym stablemates Reymart Gaballo, John Vincent Moralde and Mike Plania. The fight could have been a blockbuster with both fighters sporting impressive records. Dela Torre is yet to lose in 19 fights and owns 12 knockout victories, while Rodriguez has 21 wins, 15 by knockouts and one draw. Rodriguez has collected 15 straight wins since settling for a draw against Cesar Garcia last October 13, 2012 at the Home Depot Center in Carson, CA. Material Courtesy of: Sanman Promotions Used With Permission. The official weigh-in for tonight’s Undisputed Jr. Welterweight world championship clash between undefeated world champions Terence Crawford and Julius Indongo took place on Friday in Lincoln, NE. The official weights for the entire card are as follows. Main Event: WBC/WBO/IBF/WBA Jr. Welterweight world championship – 12Rds. Terence Crawford (WBO/WBC champion) 140lbs. vs. Julius Indongo (IBF/WBA champion) 139lbs. NABF Light-Heavyweight championship – 10Rds. Robert Frankel 139lbs. vs. Mike Reed 141lbs. Bryant Jennings 230 3/4lbs. vs. Daniel Martz 255 1/4lbs. Shakur Stevenson 126 1/4lbs. vs. David Paz 125 1/2lbs. Dillian Whyte 260lbs. vs. Malcolm Tann 238 1/4lbs. Mike Alvarado 148lbs. vs. Sidney Siqueira 145 1/4lbs. Steven Nelson 175lbs. vs. Cesar Ruiz 175lbs. Kevin Ventura 132 1/4lbs. vs. Baltazar Ramirez 133lbs. Crawford vs. Indongo takes place Tonight (Saturday, August 19th) at the Pinnacle Bank Arena in Lincoln, NE. The card can be seen in the United States on ESPN beginning at 10PM ET/7PM PT and will be also be available on ESPN Deportes and the Watch ESPN and ESPN apps. A porton of undercard bouts will be available on the Watch ESPN and ESPN apps beginning at 6:30 PM ET/3:30PM PT. for more information and channel listings in your area please visit: www.espn.com. In the United Kingdom and Ireland the card can be seen on Sky Sports Main Event (Formerly Sky Sports 1) beginning at 2 AM (Sunday, August 20th Local UK Time.) For more information about Sky Sports please visit: www.skysports.com. Press Release August 15, 2017 (Originally released August 14, 2017) By Sanman Promotions - Raymond Tabugon and Lolito Sonsona arrived in Melbourne, Australia Tuesday morning for their respective assignments in the "Punches at the Park 5" on August 19 at the Melbourne Park Function Centre. Accompanied by Sanman Promotions chief executive officer Jim Claude Manangquil, the two fighters arrived in the country known as “The Land Down Under” via Philippine Airlines. Tabugon (20W-7L-1D, 10KOs) is gunning for a huge upset when he and Andrew Moloney battle for the WBA Oceania Super- Flyweight and OPBF Silver Super-Flyweight belts. Moloney is yet to lose in 13 fights and has eight knockout victories. Sonsona (21W-1L-4D, 9KOs) for his part will be fighting Andrew’s twin brother Jason for the WBA Oceania and OPBF Silver Super-Bantamweight titles. Just like his brother, Jason is also unscathed as he has piled up 13 successive victories. Punches At The Park 5 takes place Saturday, August 19th at the Melbourne Park Function Centre in Melbourne, Australia. The card can be seen on a pay-per-view basis worldwide on the Fite TV app for $14.99 beginning at 5AM (United States EST) The Fite TV app is available on the Google Play Store as well as the Apple App Store. For more information about Fite TV and how to cast content to your TV please visit: www.fite.tv. For his part, Mananquil shrugged off Domingo’s statements, expressing confidence of emerging victorious. “I don’t care what he and his trainers say. He said he will knock me out but during fight night, I’ll make sure I am not going to lose the fight,” said Mananquil. Currently enjoying a five-fight winning streak, Waminal has 11 wins with six knockouts and with only one defeat. Mananquil said he knows Waminal is a talented fighter but there is no doubt in his mind who is the better boxer. “I respect him. He is a great boxer but I will make him look ordinary in our fight,” Mananaquil said. “Every fight is important for me. But this is more important since it is for an OPBF title. He is a good boxer but I’ll make sure I will go home victorious,” added the 25-year-old Mananquil, who sports a 14W-1L-2D, 3KOs record. Waminal coming from a very respectable gym is something that doesn’t bother Mananquil a bit. “Why would that intimidate me? I am from a top gym as well. I will not push for a knockout but if there’s an opportunity, I will definitely go for it” added Mananquil. To ensure a victory, Mananquil has been putting the needed work in the gym. He sparred for eight rounds last Friday and has been doing rounds of jogging in the mountains with his stablemates. The Mananquil-Waminal duel will be the co-feature in the main event showdown between Jade Bornea (8W-0L-5KOs) and Thailander Jakkrawut Majoogoen (19W-1L, 11 KOs). At stake in the Bornea-Majoogoen fight is the International Boxing Federation (IBF) Youth Super-Flyweight title. Material and Photo Courtesy of Sanman Promotions Used with permission. The official weigh-in for the latest installment of Golden Boy Promotions’ popular LA Fight Club series took place on Wednesday in Los Angeles, CA. The official weights for the entire card, which will be headlined by an eight round Jr. Lightweight bout between Charles Huerta and Miguel Angel Gonzalez are as follows. Main Event: Jr. Lightweight – 8Rds. Charles Huerta 130lbs. vs. Miguel Angel Gonzalez 129 3/4lbs. Christian Gonzalez 134 3/4lbs. vs. Daniel Perales 135lbs. Rafael Gramajo 121 3/4lbs. vs. Felipe Rivas 120 1/2lbs. Francisco Esparza 125 3/4lbs. vs. Fernando Fuentes 123 1/2lbs. LA Fight Club: Huerta vs. Gonzalez takes place Tonight (Thursday, August 10th) at The Belasco Theater in Los Angeles, CA. The card can be seen in the United States on Estrella TV beginning at 10PM ET/7PM PT. The card will also be available on www.ringtv,com and the Fite TV app beginning at 9PM ET/6PM PT and will be available worldwide. The Fite TV app is available on the Google Play Store as well as the Apple App Store. For more information about Fite TV and how to cast content to your TV please visit: www.fite.tv. Press Release: August 9, 2017 By Sanman Promotions- One doesn’t have to remind Jade Bornea how high the stakes are in his upcoming fight against a Thailander opponent. In fact, the 22-year-old boxer from General Santos City is feeling some pressure to deliver but don’t expect him to just cave in as he vowed to put on a spectacular show against Jakkrawut Majoogoen in the main event of “Road to Stardom” fight card slated September 9 in Polomolok, South Cotabato. “There’s a little pressure as it will be my first defense of my IBF Youth title, but I’ll use that pressure to my advantage since I perform better when under pressure especially against good opponents,” said Bornea. Bornea of Sanman-Amoy Gym has had a stellar amateur career, beating the likes of Murodjon Akhmadaliev, a 2016 Olympic Bronze medalist, Kosei Tanaka, the current WBO Light-Flyweight champion and KJ Cataraja, the unbeaten prospect of the ALA Boxing Gym. “As a professional boxer, I think Majoogoen is my toughest opponent to date,” said Bornea, who is still unbeaten in eight fights with five knockout victories. Majoogoen is definitely no easy prey. He is a former WBC World youth champion who has 19 wins with only one loss. The Thailander is also known to putting opponents to sleep as 11 of his victories came by way of knockouts. But Bornea is unfazed of the quality of the opponent he is facing and vowed to do everything in his bid to bolster his stock. “He has a good record and a former WBC world youth champion but I will try to knock him out if the opportunity comes,” warned Bornea. Against Majoogoen, Bornea stressed that it is not just about getting a win. He warned that he will be out to prove he has what it takes to face some of the biggest names in his division. Press Release: August 7, 2017 (Originally released August 6, 2017) By Sanman Promotions- The hard-punching Romero “Ruthless” Duno will be showcasing his immense talent in foreign soil once more as he will see action at THE "Fabulous" FORUM in Los Angeles, California, USA on September 23 against a yet to be announced opponent. The card that will be put up by The Golden Boy Promotions of boxing great Oscar deal Hoya will be headlined by Jorge Linares, who will be defending his WBA/WBC/RING World lightweight titles against Luke Campbell. It will be the second time that Duno (14W-1L-0D-13KOs) will be fighting in the US following his sensational second-round knockout win over Christian Gonzalez last March 10 at the Belasco Theater in Los Angeles. “This is a massive opportunity for Romero Duno to showcase his talents and show to everybody that his win over Chimpa Gonzalez was no fluke. We thank Robert Diaz and Golden Boy Promotions for the opportunity,” said Jim Claude “JC” Manangquil of Sanman Promotions. Duno is thankful for the opportunity and vowed to make the most out of it. “I am blessed to be fighting in a huge card in the US. I thank the Golden Boy Promotions and Sanman boxing for the opportunity. I will continue to work hard and bring glory to the Philippines,” said Duno. Dexter Tan, chief finance officer of Sanman Promotions, expressed confidence that Duno will be well-prepared for the task at hand. “Duno has been in the US since the second week of June. He will be 100 percent ready on September 23,” Tan said. Duno last saw action on June 10 in the main event of Brawl at the Mall: The Homecoming that saw him knocking out Jason Tinampay in the second round at the Robinsons Mall Atrium in General Santos City. The month of July in the sport of Boxing was highlighted by several fights that shined the light on the sport’s international scene. Of course, much of the discussion over the last few weeks centered on what some see as a controversy when future Hall of Famer Manny Pacquiao lost his WBO Welterweight world championship to undefeated number one contender Jeff Horn in Brisbane, Australia on July 1st. There were however, other bouts that took place throughout the course of the month that should be discussed. The first of these bouts also took place on July 1st as longtime Heavyweight contender Alexander Povetkin returned to the ring to face Andriy Rudenko in Moscow, Russia. This was Povetkin’s first fight since knocking out former world title challenger Johann Duhaupas in December of last year. A fight where Duhaupas entered the bout on short notice after Povetkin’s original opponent Bermane Stiverne withdrew from the fight following Povetkin testing positive for the banned substance Osterine. Povetkin was subsequently suspended by the World Boxing Council (WBC) and prohibited from participating in WBC sanctioned fights indefinitely after previously testing positive for the banned substance Meldonium earlier in 2016 prior to Povetkin’s scheduled fight against undefeated WBC Heavyweight world champion Deontay Wilder. Despite the WBC suspension, the ruling does not have the ability to prevent Povetkin from continuing on with his career. This was a fight that seemed as though it would end before it really could begin as Rudenko suffered an injury shortly after the beginning of the bout as midway through the first round following a brief clinch Rudenko appeared to crack his neck and sustained an injury in the process. Even though it appeared the fight would be stopped due to the neck injury after several minutes of a delay, Rudenko was able to continue the combat. Although Rudenko was quite “Game” and deserves all the credit he receives for being able to fight on, Povetkin’s quicker hands and combination punching was the story of this fight as he boxed his way to a convincing twelve round unanimous decision. With the win Povetkin, who has previously held interim/regular champion status in the WBA’s Heavyweight ratings earned the WBA Continental and WBO International Heavyweight titles, which in simple terms means it will elevate Povetkin’s positioning in both the World Boxing Association (WBA) and World Boxing Organization (WBO) respective Heavyweight ratings. Although Povetkin will likely have to contend with some stigma from the two infractions that have been ruled against him with regard to the use of banned substances, Povetkin is still a contender in the Heavyweight division. It will be what he does going forward that will determine not only if he can get back in the hunt for an opportunity at a world championship, but more importantly if the two infractions will ultimately put a question mark on his career. One of the more interesting highlights of July came on July 15th as IBO Super-Middleweight world champion Chris Eubank Jr. made the first defense of his crown against former two-division world champion Arthur Abraham at the SSE Arena Wembley in London, England. Readers might recall in previewing this bout, this observer stated that the champion Eubank had all the theoretical advantages in his favor. Youth, hand speed, an unorthodox style, punching power, and was capable of ending a fight with either hand. The primary question going into this fight was how the challenger Abraham would combat Eubank given the champion’s advantages and having good lateral movement, a component that along with hand speed has caused Abraham problems throughout his career. Despite having an experience edge over the champion, Abraham was unable to land anything significant and spent most of the fight on the defensive as Eubank dominated the championship bout and scored a twelve round unanimous decision to retain his IBO world championship. Eubank simply did what he had to do against an experienced former champion. What was significant beyond Eubank being able to successfully defend his crown for the first time was with the victory Eubank earned a spot in the upcoming World Boxing Super Series Super-Middleweight tournament. A single elimination tournament, which will also include WBA world champion George Groves and will also determine a new World Boxing Council (WBC) Super-Middleweight world champion. A championship that is currently vacant. Eubank will defend his IBO world championship in the first round against top Super-Middleweight contender Avni Yildirim at a date yet to be determined. Although this observer looks forward to providing more insight as the first World Boxing Super Series, which will also include a single-elimination Cruiserweight tournament, draws closer, the winner of the Super-Middleweight tournament will become the central figure in the 168lb. Super-Middleweight division. It is an intriguing tournament concept that could provide fireworks and I hope it is something that will prove to be beneficial for the sport in the long-term. The third significant bout that took place in the month of July took place at the Barclays Center in Brooklyn, NY. An intriguing battle between multi-division world champions Mikey Garcia and Adrien Broner fought at the Jr. Welterweight limit of 140lbs. Going into this fight, I expected to see a tactical battle given that both Garcia and Broner are boxer/punchers, who are both highly skilled counter punchers. What was immediately noticeable to this observer was Broner elected to use more lateral movement in this encounter than had been the case in previous fights. Rather than standing in the pocket and looking to deflect punches with a style that uses a shoulder roll defense, similar to future Hall of Famer Floyd Mayweather’s Boxing style, and looking to counter punch, Broner appeared as though he was trying to change his approach early on. Whether or not this change in tactics was due to facing a naturally aggressive fighter with quick hands in Garcia is a question that only Adrien Broner can answer, but it became clear as the fight progressed that the change was not working in the former four-division world champion’s favor. This was due to Garcia applying consistent pressure, positioning himself in ways where it was difficult for Broner to counter effectively, and his ability to be tactical in how he placed his punches. Although he was not always aggressive in every minute of every round, Garcia’s performance in this fight is something that could be used as an illustration of the difference between what is mere aggression and what is effective aggression. Despite being able to be effective in spots as the fight progressed, almost anything Broner was able to land Garcia had an answer for as I scored this fight ten rounds to two or 118-110 in points in Garcia’s favor. What is an interesting question coming out of this fight is what might be the potential options for the undefeated three-division world champion Garcia. Although Garcia was impressive in what was his debut as a 140lb. Jr. Welterweight, he still holds the WBC world championship in the 135lb. Lightweight division and one might think that the question of where he fights next in terms of weight class might come down to what is the most lucrative option available for him rather than a question of whether he could make the 135lb. Lightweight limit. In this observer’s eyes, I believe a viable option for Garcia could be to possibly face the winner of the upcoming unification bout that will for the first time determine an undisputed world champion in the Jr. Welterweight division as WBO/WBC world champion Terence Crawford will meet IBO/IBF/WBA world champion Julius Indongo on August 19th in Lincoln, NE. If one were to assume that Garcia will not be looking to go back down in weight to the Lightweight division, an encounter with the winner of this fight is one that would make sense for both the newly crowned undisputed Jr. Welterweight world champion as well as Garcia given his star status in the sport. Of course, whenever there is the possibility of a unification bout or in this case full unification of a world championship, there is always the question of what the mandatory championship defense obligations for the undisputed champion will be among the respective sanctioning organizations that comprise a unified or “Undisputed” world championship. It remains to be seen where Garcia off of his victory over Adrien Broner will be ranked if he opts to remain in the Jr. Welterweight division, but along with the question regarding mandatory championship defenses that surround a unified or undisputed world champion in the aftermath of a unification bout, the inevitable question among Boxing fans is usually who in their estimation is the next legitimate challenger for the champion. 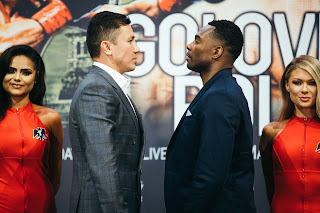 Although there is certainly no shortage of top challengers in the traditionally talent deep Jr. Welterweight division, some may believe Garcia is that challenger after his impressive performance against Broner. As the month of August has begun, the question will be what will follow. With the full unification of the 140lb. Jr. Welterweight division and World Boxing Super Series looming as well as some interesting possibilities that exist in the Heavyweight division, there will be no shortage of stories in Boxing in the remainder of 2017. Press Release: August 3, 2017 By Sanman Promotions -Jade Bornea’s career is off to a sterling start. But whether he is for real or not will be known come September 9 when he battles a dangerous Thailander opponent in the “Road to Stardom” at the Polomolok Gym in Polomolok, South Cotabato. The latest offering of Sanman Promotions will have Bornea taking on Thailand’s Jakkrawut Majoogoen for the IBF Youth Super Flyweight belt. Bornea of Sanman-Amoy Gym is still unbeaten in eight fights with five knockout victories and his mettle will be tested by the more experienced Majoogoen, a former WBC World youth champion who sports a 19W-1L-0D, 11KOs record. Apart from the Bornea-Majoogoen duel, another fight to watch out for is the co-main event showdown between Sanman fighter Ben Mananquil and the promising Jess Rhey Waminal of the ALA Boxing Gym in Cebu City. “This is going to be an explosive card. Majoogoen and Waminal are two quality fighters who can definitely give Bornea and Mananquil a good run for their money,” said Jim Claude “JC” Manangquil, chief executive officer of the Sanman Promotions. The Mananquil-Waminal duel will be for the OPBF Silver Bantamweight belt. Mananquil has 14 victories, one loss and two draws with three knockout wins tucked under his belt. Waminal is off a to solid start as a pro as he won 11 of his first 12 fights highlighted by six knockout wins. Manangquil said the card, which is co-presented by the municipality of Polomolok headed by Mayor Honey Lumayag, will be streamed live on Facebook via the SANMAN Live. A regular feature here at The Boxing Truth® is to poll our readers with regard to various subjects and events that occur in the Boxing world. Our latest reader poll concerns one of the most anticipated upcoming events in the sport and we would like to ask our readers this question. Will you be ordering the Mayweather-McGregor pay-per-view card on August 26th?